BUFFY: PLEASE CONTACT TNG REGARDING YOUR UNPAID UPGRADE INVOICE FROM DEC. 3, 2015. Dorothy Dessert passed from this life on January 17, 2012 after a courageous struggle following heart surgery. She left peacefully while at home in the company of Buffy, her daughter and Dermott, her son. She died with dignity, grace and a full faith in God. Dorothy Ann Brophy was born July 13, 1928 in Kansas City, Missouri, to Dorothy and William Brophy. The Brophy family moved to New Rochelle, New York in 1932?. She graduated from Ursuline Academy at New Rochelle, NY in 1945. As a freshman at the College of New Rochelle she became engaged to Rolland (Rolly) Archibald Dessert, West Point Class of 1946. 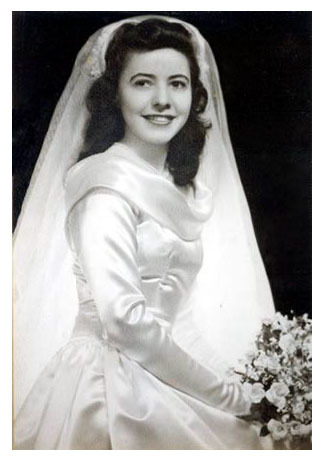 She and Rolly were married at Fort Benning, Georgia on October 26, 1946. As the priest pronounced them husband and wife, a loud cheer went up from the crowd at a football stadium across the street from the Chapel. The home team had just scored a touchdown and the cheer was proven an apt metaphor for the beginning of Dottieâ€™s married life with Rolly. Dottie and Rolly spent the next 21 years and more than 20 moves traveling to various United States Army assignments around the world â€“ Georgia, Japan, Kentucky, North Carolina, Kansas, Germany, Spain, and Florida. Along the way, Dottie and Rolly raised six children all born in Army hospitals in Fort Benning, Georgia; Fort Campbell, Kentucky, and Fort Leavenworth, Kansas. Rolly served in uniform for twenty-one years, and Dottie was the dutiful officerâ€™s wife supporting him and his career with cheerfulness and a wonderful sense of humor. While Rolly served two combat tours in Korea and Vietnam, Dottie raised the family alone. She spoke fondly of the people she met in the Army and she was particularly impressed with the Japanese and Germans for their strength and resilience in postwar Japan and Germany. Many Sunday drives in the family Ford station wagon were opportunities for Dottie to teach her children about European history, culture, art, music and architecture. Rolly and Dottie moved the family to DeLand, Florida in 1962 just prior to Rollyâ€™s deployment to Vietnam. Upon retirement from the Army in 1967, Rolly and Dottie chose DeLand as home. Rolly launched a career as a high school teacher, and Dottie worked for Stetson University where she put in the first IBM System 38 computer and later for General Electric, where she was the program manager for the radar tracking systems for the Apollo Moon Missions. Dottie and Rolly were faithful and active volunteers at Saint Barnabas Episcopal Church in DeLand. Her service with the Altar Guild spanned over 40 years, many as the directress. In 1982, Dottie was the head of the Organ committee. Her committee was successful in raising over $80,000 to replace the old organ with a Visser-Rowland Tracker Action Organ. Dottie was preceded in death by her husband Rolly, Sr., her parents, Dorothy and William, and her brother Ross. She is survived by her brother Gerald Brophy of Amherst, Massachusetts, and sister Barbara (Krogius) of Laguna Niguel, California. She is also survived by her children, Rolly, Jr. (Karen) of Lansing, KS; Ross (Terry) of Kirkland, WA; Claire of Macclenny, FL; Buffy Hunt (Dan) of DeLand, FL; Dottie Smith (Larry) of Winchester, VA; and Dermott of DeLand, FL. Dottie leaves behind 19 grandchildren (Jennifer, Elizabeth, Ross, Lauren, Christopher, Farrell, Erin, Emily, Brooke, Graham, Patrick, Wendy, Katherine, Matthew, Andrew, Daniel, Joseph, Ruth and Ian) and 26 great grandchildren (Jonah, Kaelyn, Kinsey, Alena, Corrine, Emma, Stella, Francesca, Peter, Isabella, Eden, Trinati, Avery, Gianna, Isaac, Maria, Dean, Elan, Tavi, Liam, Leo, Graeme, Grace, Harley, Ruby, and Evelyn). She was a devoted and loving wife, mother, grandmother, and great grandmother who will be dearly missed by all who loved her. Visitation will be at Saint Barnabas Episcopal Church in DeLand, Florida at 11:00 a.m. on Saturday, January 28, 2012 followed by a funeral service and interment.